ARE YOU CURIOUS ABOUT THE SUZUKI METHOD? 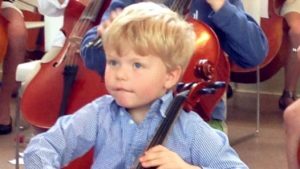 DO YOU HAVE A CHILD BEGINNING STRINGS IN THE FALL? Come to the Suzuki Jump Start to Twinkles Program held by the Greenwich Suzuki Academy! This fun, summer class will lay the fundamentals for learning the Twinkle Variations. This class is offered for violin, viola, and cello. No experience necessary! Cost is $120 for the course and includes all materials.